This IC Basic Tutorial will help you learn the basics of an IC or Integrated Circuit. What is an IC or Integrated Circuit? Integrated Circuit or IC is an electronic component made up of combination of several transistors, diode, resistor, capacitors in a tiny semiconductor chip. Integrated Circuit Electronic Components or IC are of small size and very light weight. They produce excellent results at low power. I have divided this tutorial into several small parts for ease of reading and understanding. Read these sections to learn the basics of on IC and how it works. Components used in an IC are not visible from outside. These are built in a semiconductor chip and cannot be removed. Capacitors of more than 30 PF value are not used in IC nor can inductors and transformers be mounted inside the chip of an IC. Thousands and millions of bi-polar transistors and CMOS (Complimentary Metal Oxide Semiconductor) FET are used in making an IC. Single in-line pin package (SIPP). Dual in-line pin package (DIPP). Pin Grid Array Package (PGA). Ball Grid Array Package (BGA). Leadless Chip Carrier (LCC) Package. Linear IC – This type of IC works on analog signal where output signal varies according to the variable input signal. 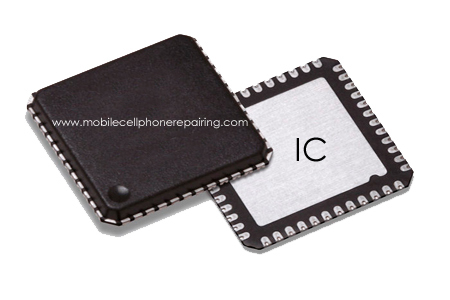 Digital IC – This type of IC works on digital signal. A defined output signal is received from a defined input signal. On the basis of electronic components used, the digital IC are of various types. Examples of Digital IC – CMOS (Complimentary Metal Oxide Semiconductor), DSP (Digital Signal Processor), DRAM (Dynamic Random Access Memory), ROM (Read Only Memory), PROM (Programmable Read Only Memory). U’re a guru sir,God bless u…..
Ur site really helped me. That is too easy. Just get training at some good Training Center and then Practice, Practice and Practice. I know Local Technicians just make fool of innocent people and loot them. how do we know if an ic is faulty. how do we read them? Thank you for giving me the opportunity to visit this impressive website. There is plenty of valuable info listed on this site. I have seen a lot of tricks. It is too much to absorb at once, thus I definitely will return to view more. I have gone through your website. It is good. I want to learn the course of mobile reparing.